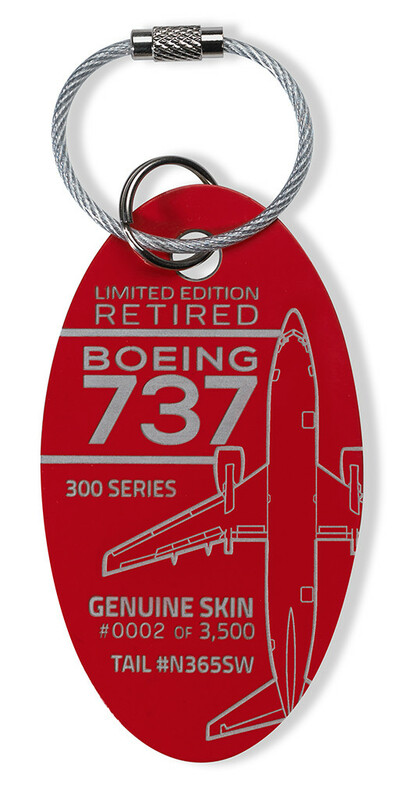 This Boeing 737 PlaneTag was cut from the fuselage of a Southwest Airlines B737-300 Tail # 365SW. The Boeing 737 was introduced in 1968 and is Boeing's only narrow-body airliner in production. In the 1980's, Boeing launched the -300, -400, and -500 series models which were referred to as the 737 classic series. Starting in 1971, Southwest Airlines has only operated Boeing 737 models and now has over 700 of the B737's in service. 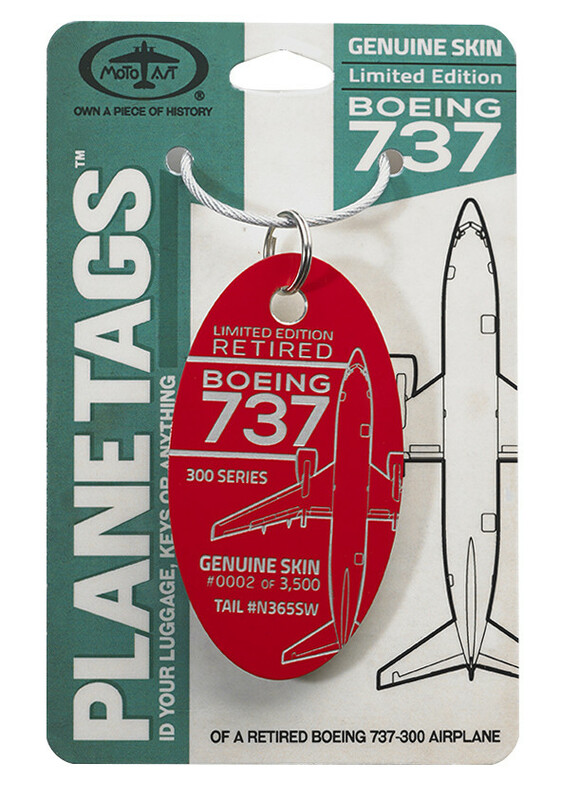 This classic 300 series PlaneTag is one of the 75 Boeing aircraft that are ending their service for the airline and beginning to be replaced by the new Boeing 737 MAX. Boeing 737-300 N365SW (serial number 26576) was originally delivered to Southwest Airlines in May 1993 and was retired from serivce in March 2016. PlaneTags are made from actual retired aircraft fuselage, not merely stamped metal. Because PlaneTags are made from real fuselage, each PlaneTag bears the color, thickness, and wear and tear from the portion of the fuselage from which it was cut and it is therefore rare to create two identical PlaneTags. These variations and imperfections are not product flaws. They are part of the beauty of PlaneTags. The images on this website are provided for reference only and should not be used as the sole basis for choosing a particular PlaneTag. This PlaneTag will be from the Red portion of the plane. We also have a Southwest Airlines PlaneTag from the Orange painted area. SAFETY NOTICE: Not recommended for children under 8 years of age. This product contains original chemical-based paint which may cause respiratory irritation if ingested or inhaled in large quantities. Keep out of mouth. If this system had zero stars, I would give it a zero. Mine arrived with a paint chip. The store personnel politely said "too bad." Review: Sentimental to me since I worked on this aircraft a few times as a Flight Attendant. It looks great on my roller bag. Pros: Great idea. The aircraft is in my logbook. Review: Cool engraved piece of 737 fuselage. Original paint. Review: Very nicely done piece of of Swa Jet. Review: I love it!! It is still on the packaging. I use to work at Southwest Airlines and worked this bird many times! Not sure what to do with this tag yet? Memories! Cons: If the price had been 5 or 6 dollars, I would accept the lack of quality. $31.00 for 4 square inches of sheet metal is a rip off. Cons: A little pricey, on one of the 4 i bought the paint was starting to peel up from the edge. Glued it down and sealed with fingernail polish. Cons: The wire attatcment strap is difficult to use.